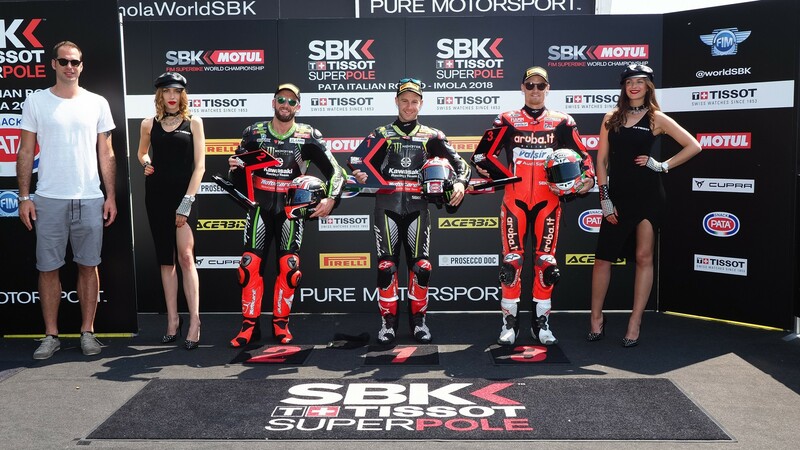 Jonathan Rea (Kawasaki Racing Team WorldSBK) grabbed his second Tissot Superpole of the 2018 MOTUL FIM Superbike World Championship season, denying teammate Tom Sykes (Kawasaki Racing Team WorldSBK) his record-breaking 44th pole right at the flag. 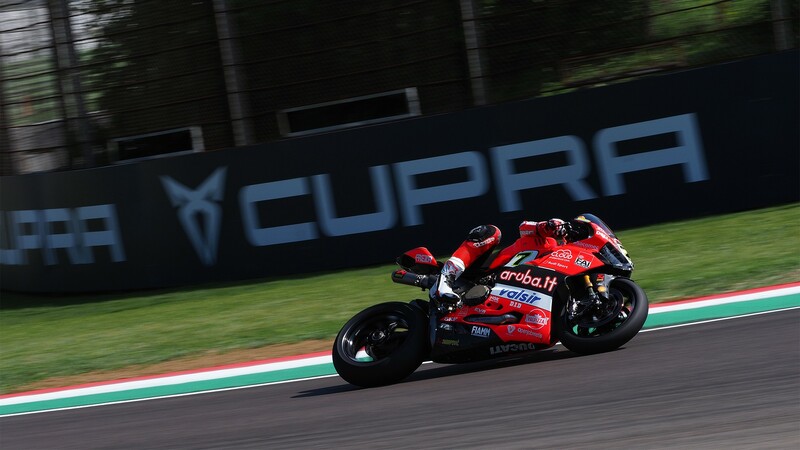 The KRT duo dominate the first line, with Chaz Davies (Aruba.it Racing – Ducati) having to fight from third at the Autodromo Internazionale Enzo e Dino Ferrari di Imola. 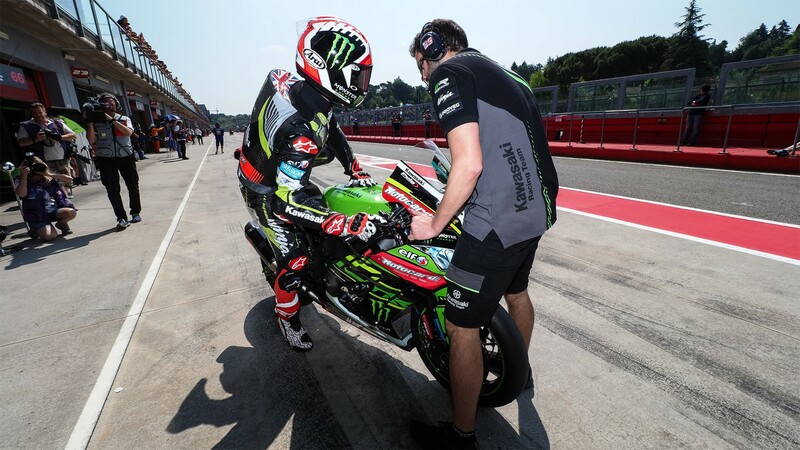 Rea stressed yesterday how important starting from pole is at Imola, with that left-hand side start crucial to face turn 2 and Tamburello in the best of conditions. His wish came true on Saturday morning, with a stunning 1’45.797 lap that shot him back to the top, where he’s been most of the weekend. It’s just his second pole at Imola, after 2014. 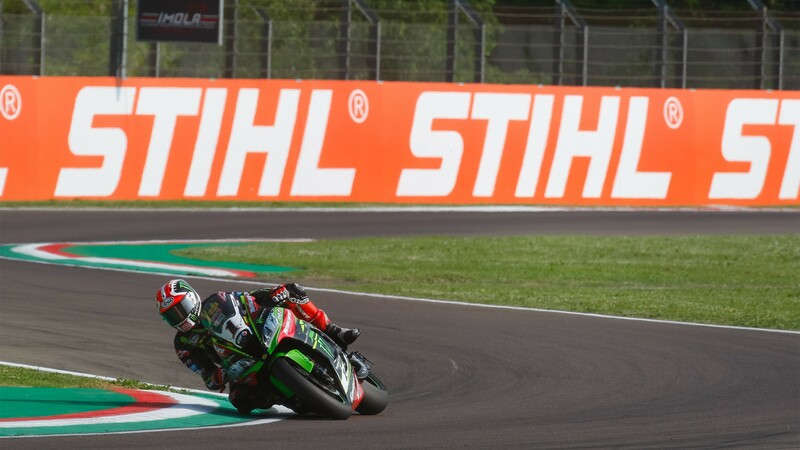 It was all between Rea and Davies yesterday, but Tom Sykes made it known that he’s willing to put up a fight here, jumping up the field on his penultimate lap and pushing the Ducatis away from the top. With 8 minutes to go in the session, Chaz Davies let his front-end go at turn 22, giving way to a dramatic race against the clock to get back to the paddock, fine-tune his bike, and jump back onto the track. He only had time for one lap, which was nonetheless enough to give him a front row start. He starts just ahead of his teammate Marco Melandri (Aruba.it Racing – Ducati), who despite this will be encouraged by both his performance on the day, and his ideal placement on the grid going into Tamburello. Continuing in row 2, Xavi Fores (Barni Racing Team) pipped ahead of Eugene Laverty (Milwaukee Aprilia) by just three thousandths of a second. Laverty was lucky to make it into the second Superpole, only recording 3 laps in the Superpole 1 and being displaced momentarily by Toprak Razgatlioglu (Kawasaki Puccetti Racing). 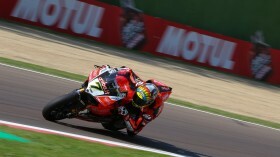 The Turkish rider had his last lap deleted, however, and Laverty made up for it with great pace on his WorldSBK return. 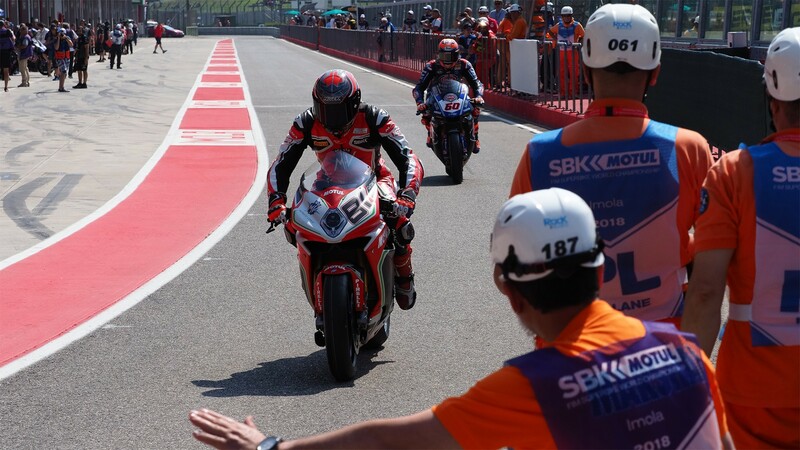 Leading the way in row 3 will be Jordi Torres (MV Agusta Reparto Corse), edging ahead of the Italian pairing of Michael Ruben Rinaldi (Aruba.it Racing – Junior Team) and Lorenzo Savadori (Milwaukee Aprilia). Filling row 4, Alex Lowes (Pata Yamaha Official WorldSBK Team) and Michael van der Mark (Pata Yamaha Official WorldSBK Team) confirmed that the Yamaha is struggling compared to the rhythm it showed at Assen, and will start in tenth and twelfth, respectively. Stuck between them is Leon Haslam (Kawasaki Puccetti Racing), on his WorldSBK return. 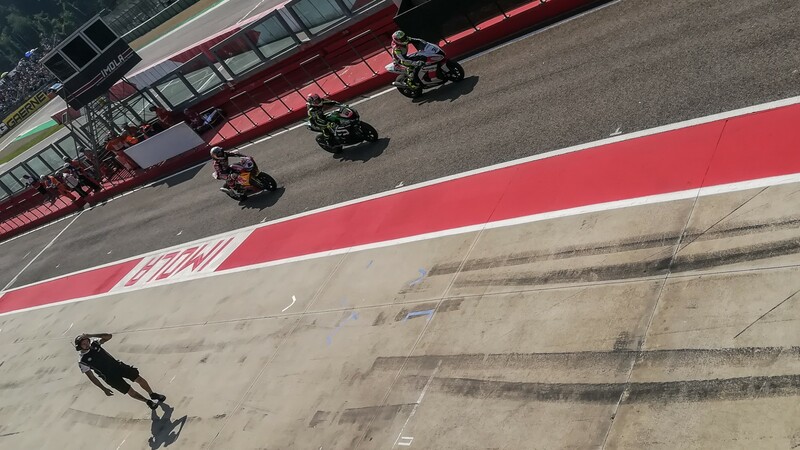 At 13:00 (11:00 GMT) it’s lights out from Imola, with an unmissable WorldSBK Race 1! Catch it live or on demand, thanks to the WorldSBK VideoPass!